Corruption is one of the most widespread social evils in Nigeria; it is seen as a main threat in the public and private sphere. It undermines fragile democratic systems by fuelling popular disillusionment with politics and politicians; it also undermines trust and confidence, which are necessary for upholding and development of sustainable economic and social order. Corruption is not only peculiar to Nigeria, it is a global phenomenon. 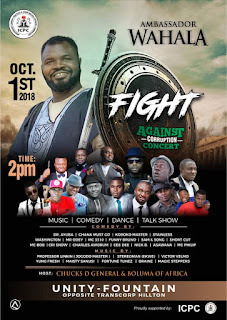 However, anti-corruption war in Nigeria is like a gun-war being fought with bows and arrows, it is a war that can turn its fighters into victims and those being fought into heroes, it is a war that both sides manipulate to gain personal and political points, it is a 'world' of controversies, politics, extensive debates and high public expectations. On a lighter note, Professional theatre practice in Nigeria, has, over the years, suffered serious neglect. Many reasons have been adduced for this comatose state of the theatre, ranging from lack of facilities, government support, and funding, as well as negative audience attitude to the profession, to the state of insecurity. It has created a situation where trained theatre artists find succour in other areas of endeavour to make a living, to the detriment of the theatre profession. In the midst of this development, the stand-up comedy genre has risen to be a veritable medium of live artistic entertainment. Comedy, originally of a theatrical genre, was simply described as a dramatic performance, which pits two societies against each other in an amusing conflict. 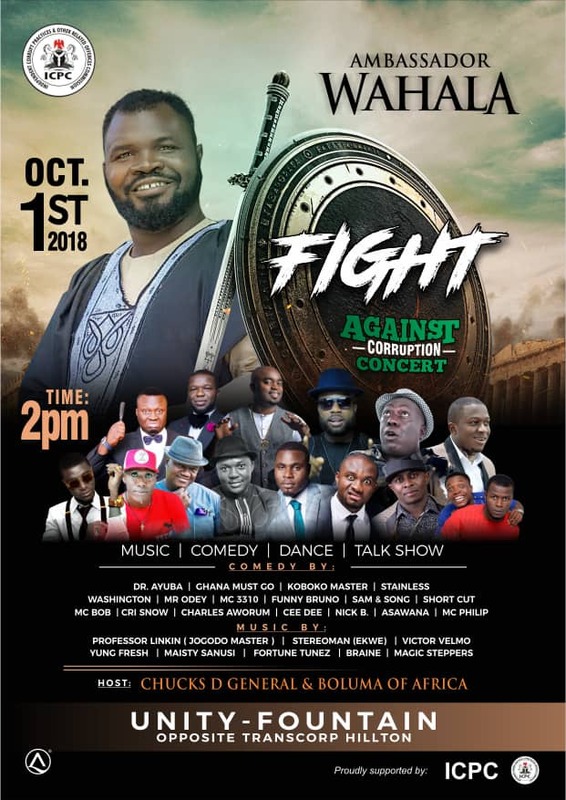 The event, FIGHT AGAINST CORRUPTION CONCERT billed to take place at the Unity Fountain (opposite Transcorp Hilton Hotel) Abuja will consist of Comedy, Music, Talk Show and Dance. Notable talented artistes expected to perform include Dr. Ayuba, Ghana Must Go, Koboko Master, Stainless, MC Bob, CRI Snow, Charles Awurum, Cee Dee, Nick B., Asawana, and MC Philip. Musical performances are expected from Professor Linkin, Jogodo Master, Stereo Man (Ekwe), Victor Velmo, Young Fresh, Maisty Sanusi, Fortune Tunez, Braine and Magic Steppers. The event which promises to take the centre stage of the day is to be hosted by Chucks D General and Boluma of Africa.